Zeb, Eider, and the humans are driving to Derby. 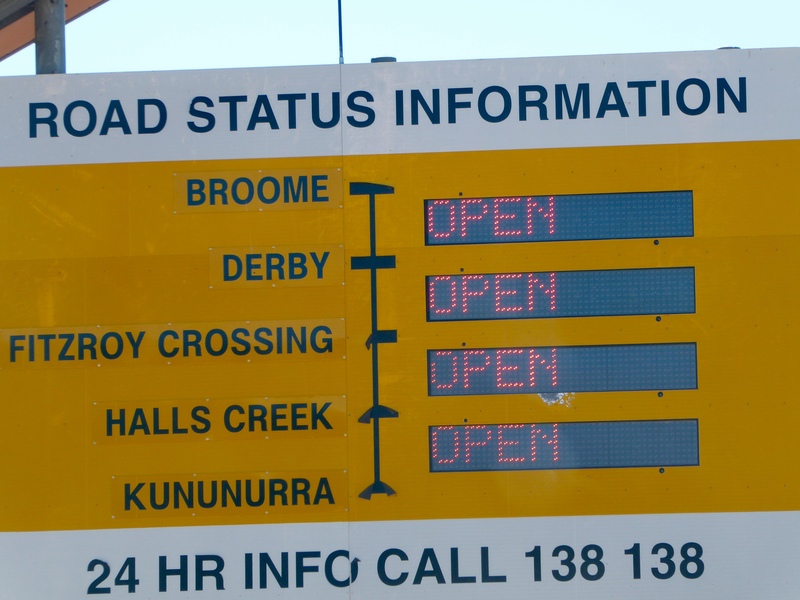 We will stay over night in Derby and then return to Broome. This sign is not too important today, but it is very important during the summer or rainy season. They call the rainy season The Wet. Much of this area will be flooded and closed. 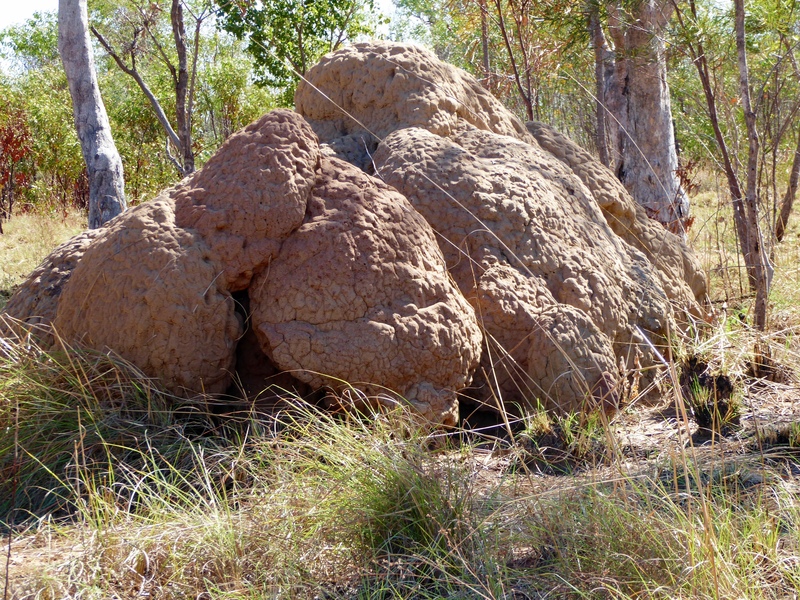 The termites have really been busy here. Lots of additions, maybe a termite town? 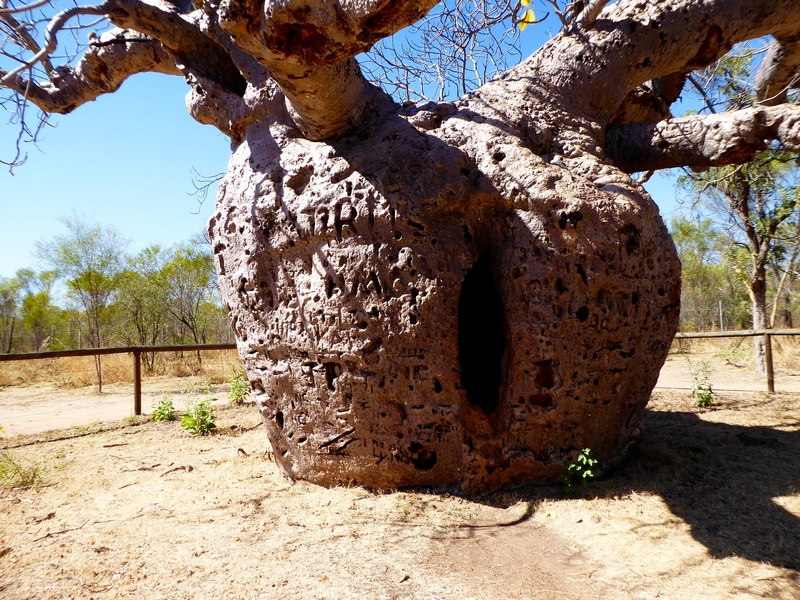 Approaching Broome, we stop at the Boab Prison Tree. This tree is believed to be about 1500 years old, and has a girth of 14 meters. The trunk of the tree has been slit and much of the trunk was hollowed out to place prisoners inside. Prisoners were put inside the tree while being transported from one area to another. In this same location, we saw the longest cattle trough. Built in 1917, it is 120 meters long and could handle 500 cattle at a time. 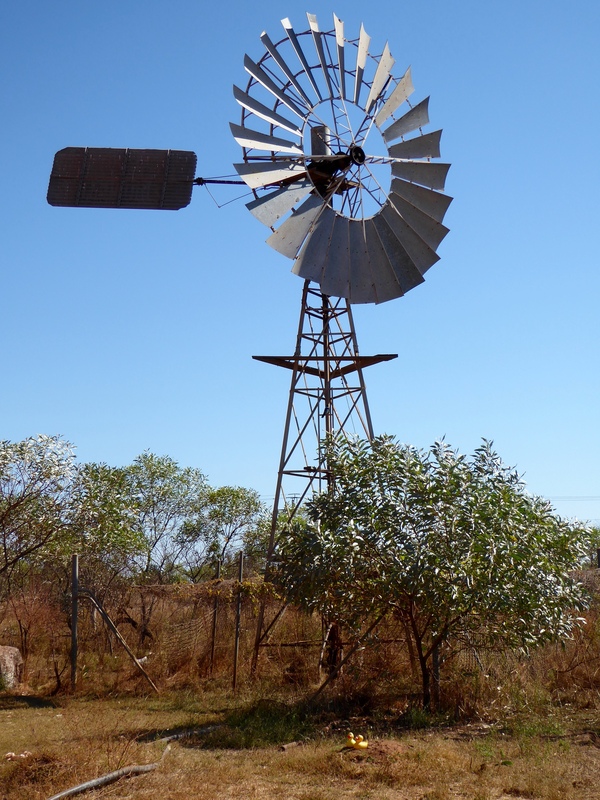 Water to the cattle trough is now pumped by this windmill. We really liked these Boab trees. 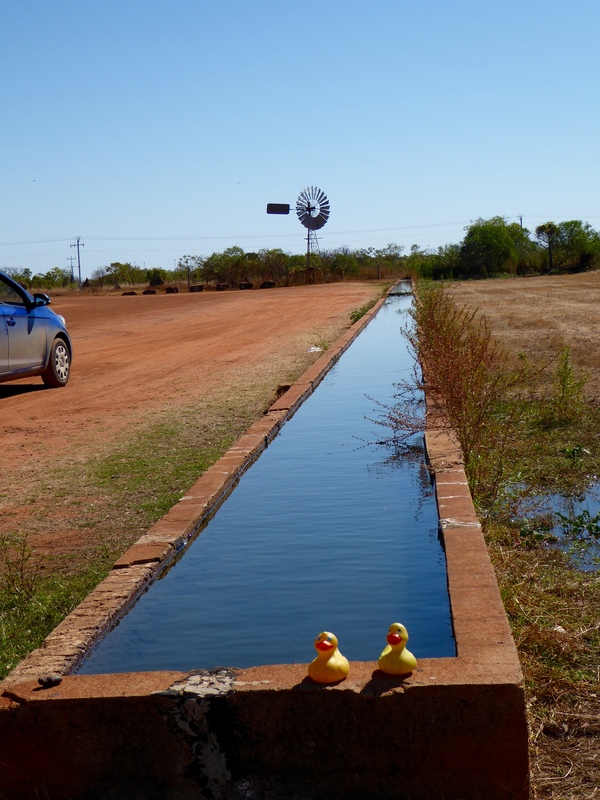 They grow only in the Kimberley region of Western Austraia and in the Victoria and Fitzmaurice river basins in the Northern Territory. 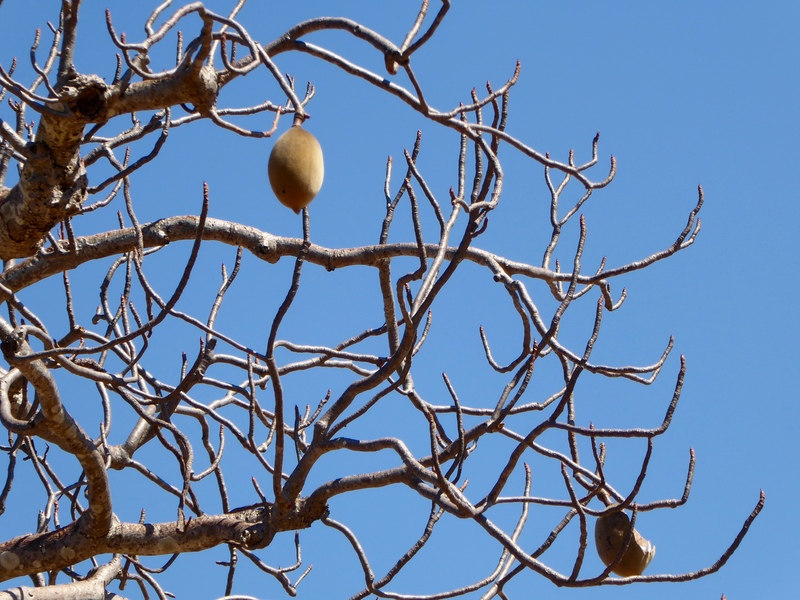 Africa and the island of Madagascar also have Boab trees. The fruit of the tree contains malic, tartaric and ascorbic acids. The seeds have high protein value. The pulp is eaten dry or mixed with water as a beverage. 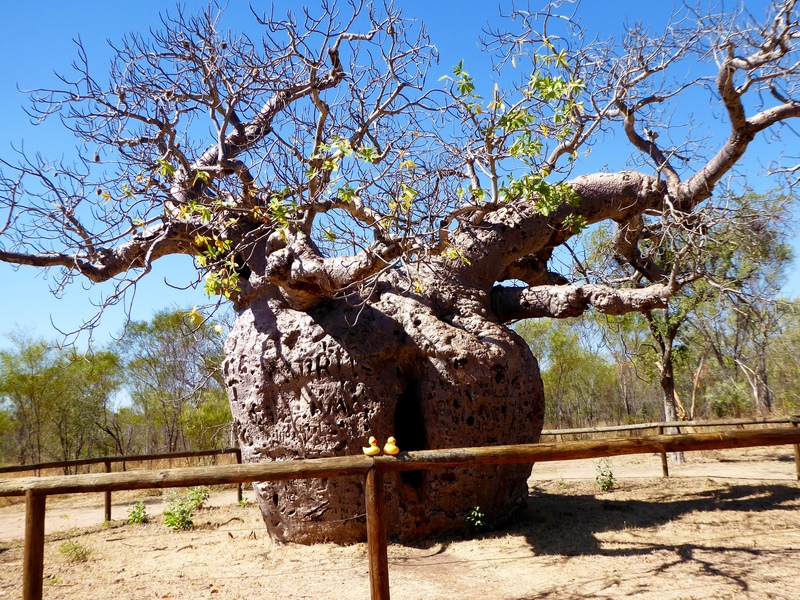 The Boab nut is also often carved and decorated to be purchased by tourists. 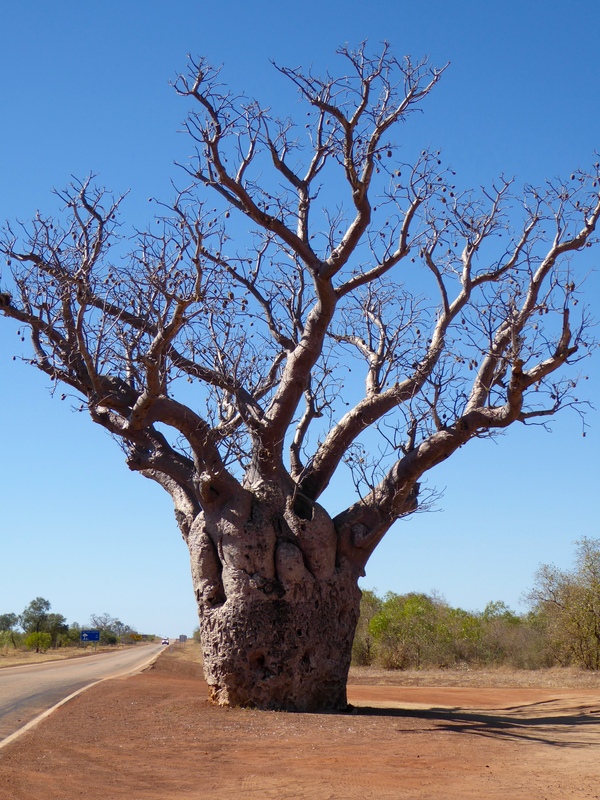 We will only see these Boab trees for a short time, so we are really looking at them. We visited the nearby Mowanjum Art and Culture Center. 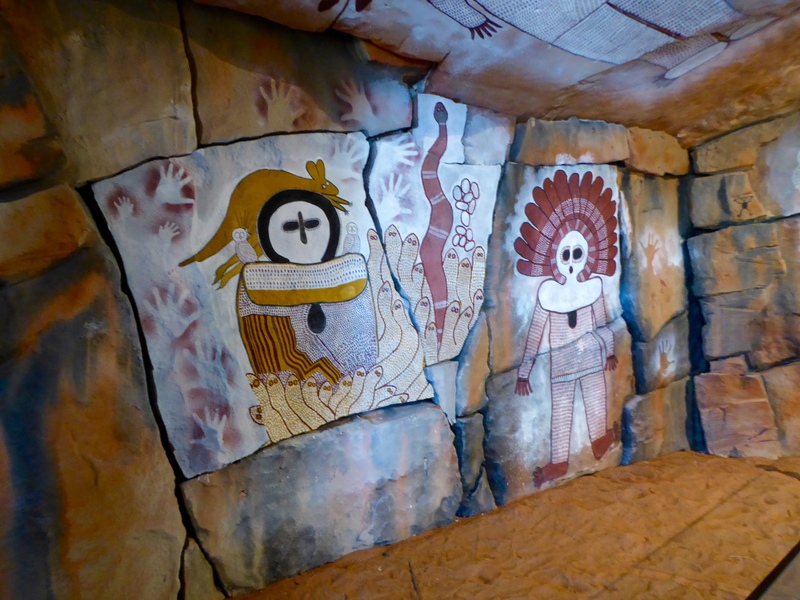 This is an example of newer aboriginal rock painting. 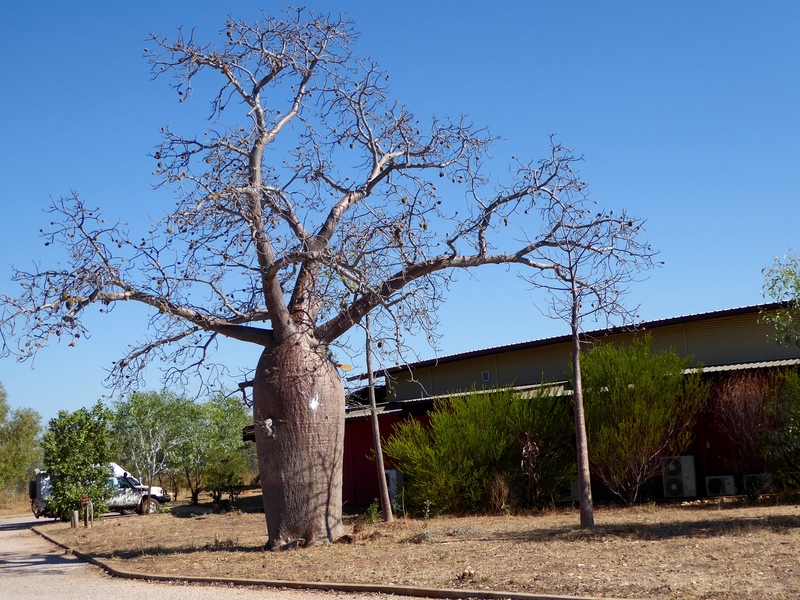 There is a Boab tree at the Mowanjum Center. Carved and decorated Boab nuts are available for purchase. 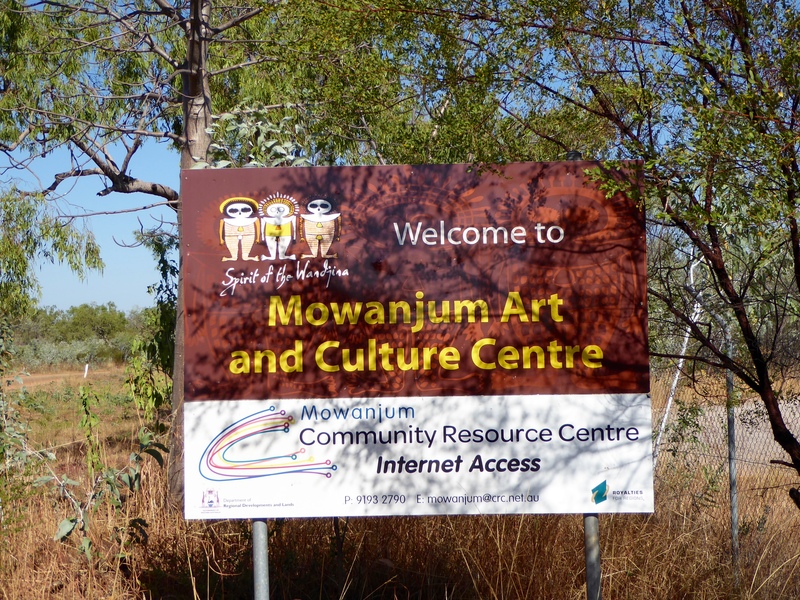 We saw and learned at the Mowanjum Center. You will like it if you visit. Next time we will show you what we found in Derby. 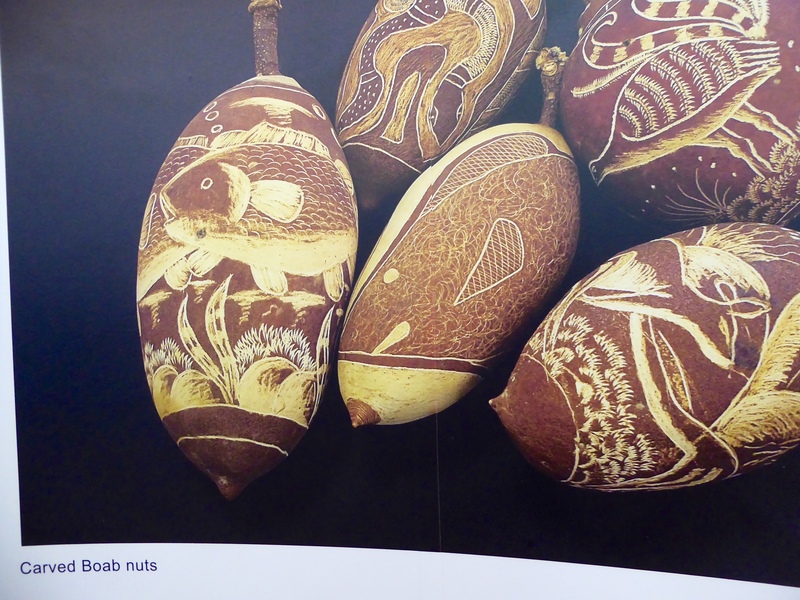 This entry was posted in Australia, Western Australia and tagged Aboriginal rock painting, Boab Prison Tree, Boab tree, carved Boab nuts, Colorado Traveling Ducks, Derby, longest cattle trough, Mowanjum Art and Culture Center, Western Australia. Bookmark the permalink. Love these trees – they would be fun to decorate for Halloween. What a great idea. Imagination is going wild and I love it! Thanks for reading and commenting.